Learn how to needlefelt a little dog using simply sheep fleece and a special needle. Once you have learnt the basic techniques, you’ll add characterful details to your new best friend! Learn how to sew on these small round mirrors, Indian-style, and add them to your handmade Christmas decorations. Play with colourful threads. This workshop will give you the chance to practise your sewing skills and learn new ones while you make an individually crafted textile decoration using sequins, ribbons, bright colours and decorative fabrics. Make your own felt teacosy or hot water bottle cover using colourful sheep fleece, soap and water. Fast results with lovely, tactile materials – great makes for Christmas gifts. Learn contemporary textile jewellery making techniques using colourful fibres, yarns, threads and beads. Select colours and textures to match your wardrobe or experiment with something new. 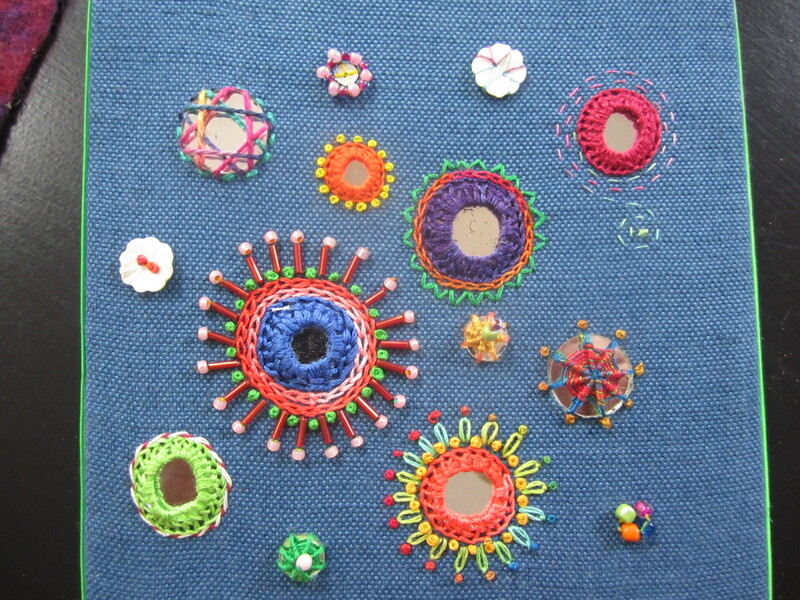 An extension of Helena’s Saturday class to develop stitch and bead work and explore your own ideas. The aim is to make one complete bird decoration to hang on your tree or give as a handmade gift. In this workshop Anna and Lilly with teach you printing techniques to upcycle an unloved tee into a statement piece ready for the festive season. Upgrade your old wardrobe through print, embellishment and design - lots of sequins, colour and fun! 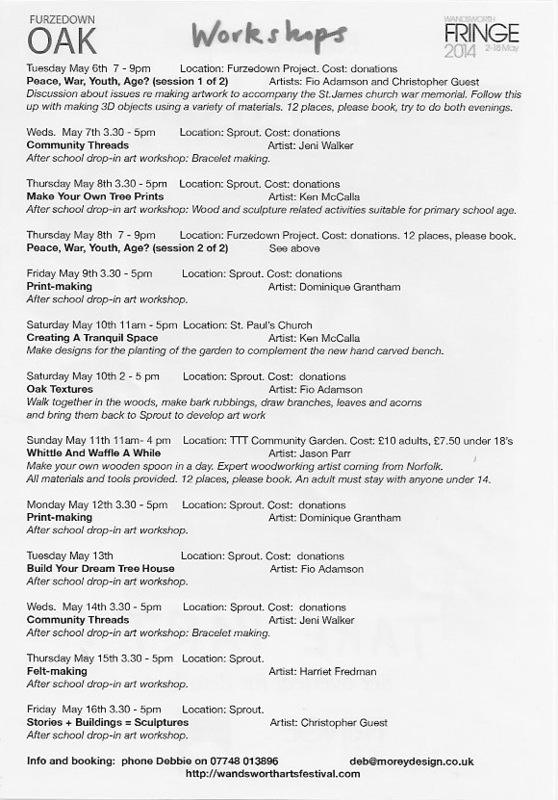 Drop-in workshops all day on both Fridays and Saturdays, offering an opportunity to ‘have a go’ at painting with acrylics. There will be images provided to copy if required. 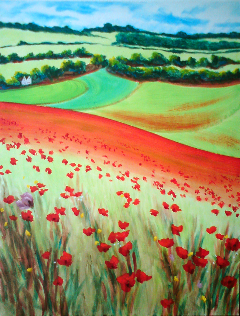 Glorious fields of poppies in Kent, city images of Paris and summer sea breezes from Greece! Gill’s popular children’s quilts will also be available for sale. Sir Owain slays the Ferocious Dragon and befriends the lion. What is the code of honour most befitting the Knights of the Round Table? Who dares to challenge the Black Knight? Summer is a coming in... let’s celebrate. Learn how to tell parts of this wonderful tale. An interactive experience for all! In this workshop you will learn how to use drama techniques to tell a story without using words, focusing instead on using the body and sound effects. Spend the afternoon being creative and having fun with FanSHEN one of Wandsworth’s leading theatre companies. The workshop is suitable for anyone aged 7 and upwards. In this workshop you will learn how to use drama techniques to tell a story without using words, focusing instead on using the body and sound effects. Spend the afternoon being creative and having fun with one of Wandsworth’s leading theatre companies.